Every blog/website/etc I looked at espoused a variety of techniques, tricks, and claimed the macaron to be the most difficult of all things to bake! YUM! This has to be my favouritest photo ever. I just really like it! Chocolate, with ganache and caramel filling. Blend the cocoa, powdered sugar, and ground almonds together so they are very fine. Beat the eggs whites to medium stiff consistency, then slowly add the granulated sugar, while beating, until stiff consistency. VERY CAREFULLY fold in the cocoa mixture, being careful not to overfold. Scoop the entire mixture into a piping bag with a #12 tip. Spray two baking sheets with water, then line with parchment paper. Carefully trace 1.5″ diameter circles all over the paper, and pipe the mixture until it fills each circle. Bake at 375 F for 15-18 minutes, then let them cool completely before removing from baking sheet. Sandwich the cookies with jam, caramel, or ganache, and let them sit for a day (covered), if at all possible. The flavours really mature after a day, and the texture is much better if they sit and rest! Trust me, they were very, very good. And for the lucky few who got to taste them, well they keep telling me they want more! 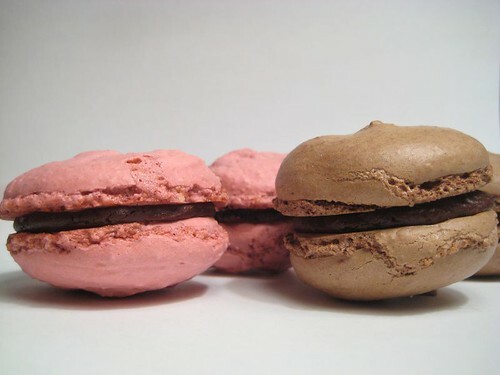 I’m hoping to create some new flavours in the future; cardamom vanilla, basil lemon, orange, pistachio, green tea, etc…. help me out by giving me some flavour ideas! I love macaroons (sp) 🙂 I remember the first time I had them. Fresh from a bakery, all nice and hot and gooey. My friend served them at her wedding. I have been a big fan ever since! Lucky you! The only macarons I’ve had are the few I’ve baked myself. I can’t find a bakery in Salt Lake that has them, and I’ve never seen them anywhere I’ve travelled. Do you remember the flavours you had?